Another fantastic week of striper fishing on Lake Texoma. The water temp is 54 degrees with a current level of 616.02 feet above sea level. Even after the full moon this month our stripers haven't missed a beat. We are fishing live bait, Gizzard Shad, either drifting or achored with a drop off or ledge close by. The water depth may vary but the past couple of days it's been in the 20 to 40 feet range. A lot of seagulls are still working the water for the bait fish and right now that can kind of fool you. 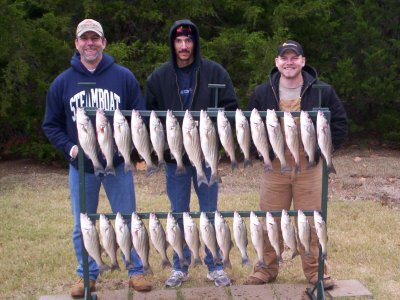 There are massive schools of bait fish almost everywhere you go on Lake Texoma. Be sure you trust your electronics. Although I am fishing live bait, lures will also work for you. I ounce Sassy Shads and COJO Minnows. Let them sink to the bottom and bring them back to the boat with a slow steady retrieve. If the you see the bait fish on the surface cast and as soon as the lure hits the water burn it back to the boat. The fish are kind of unpredictable right now. On some days they will stay with you and others you have to move to follow them, luck of the draw. 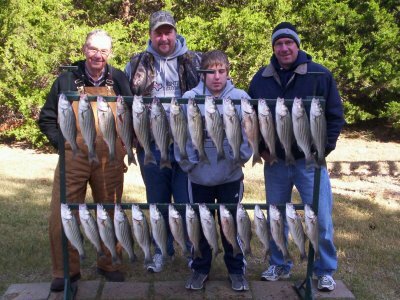 Don't miss the action, come on out and check out some fantastic fall fishing on Lake Texoma. The weather is changing day to day so be prepared and take suitable clothing. Be sure you have something with you to keep dry with and as I have said before dress in layers as the mornings are often cool and it gets warmer later in the morning. Make sure you have all your safety equipment up to par, be alert and have a great day fishing on Lake Texoma.